O God, whose Son, at his Ascension to the heavens, was pleased to promise the Holy Spirit to the Apostles, grant, we pray, that, just as they received manifold gifts of heavenly teaching, so on us, too, you may bestow spiritual gifts. Through our Lord Jesus Christ, your Son, who lives and reigns with you in the unity of the Holy Spirit, one God, for ever and ever. Mediatrix, Si! Coredemptrix, No! | Michael J. Miller M.Phil., M.A. Theol. Traditionally, today is the feast of Mary, Mediatrix of All Graces. All the graces which flow from the redemption of Jesus Christ are granted to the human family through the motherly intercession of Mary. Mary mediated Jesus Christ, the Author of all graces, to the world when she agreed to be the human mother of God made man (cf. Lk 1:38). And from the cross at Calvary (Jn 19:26) and as the final gift to humanity, Jesus gives Mary as a spiritual mother to us all: "Son, behold your mother" (cf. Jn 19:26). 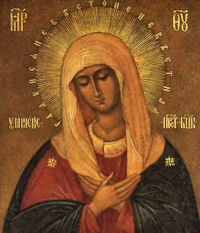 For this reason, Vatican II refers to Mary as a "mother to us in the order of grace " (Lumen Gentium, n. 62) and several twentieth century popes have officially taught the doctrine of Mary as Mediatrix of all graces, quoting the words of St Bernard: "It is the will of God that we obtain all favours through Mary." The Mediatrix performs this task in intimate union with the Holy Spirit, the Sanctifier, with whom she began the drama of our Lord's Redemption at the Annunciation (cf. Lk. 1:35). Read this article by Fr. William G. Most. Bishop of Noyon, b. at Salency (Oise) about 456; d. in his episcopal city June 8, about 545. His father, Nectardus, was of Frankish origin, while his mother, named Protagia, was Gallo-Roman. It is believed that St. Gildardus, Bishop of Rouen, was his brother. His youth was entirely consecrated to the practise of Christian virtues and to the study of sacred and profane letters. He often accompanied his father on business to Vermand and to Tournai, and frequented the schools, carefully avoiding all worldly dissipation. His exemplary piety and his knowledge, considerable for that time, decided the Bishop of Vermand (d. 530) to confer on him Holy Orders, and caused him to be chosen as his successor. Forced, in spite of his objections, to accept this heavy charge, he devoted himself zealously to his new duties. In an effort to accomplish those duties in greater security, since Vermand and the northern part of France in general were then generally troubled by wars and exposed to the incursions of the barbarians, he removed his episcopal see in 531 from Vermand, a little city without defence, to Noyon, the strongest place in that region. The year following, St. Eleutherius, Bishop of Tournai, died and St. Médard was invited to assume the direction of that diocese also. He refused at first, but being urged by Clotaire himself he at last accepted. This union of the two dioceses lasted until 1146, when they were again separated. Clotaire, who had paid him a last visit at Noyon, had his body transferred to the royal manor of Crouy at the gates of the city of Soissons. Over the tomb of St. Médard was erected the celebrated Benedictine abbey which bears his name. St. Médard was one of the most honoured bishops of his time, his memory has always been popularly venerated in the north of France, and he soon became the hero of numerous legends. 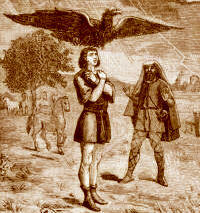 One of which says that if it rains on St. Médard's feast day it will be followed by forty days of rain; and forty days of sunshine will follow if it is clear. Patron: against bad weather; against imprisonment; against sterility; brewers; captives; harvests; for good weather; for rain; imprisoned people; mentally ill people; peasants; prisoners; toothache; vineyards. Fourteen centuries ago as bishop of Tournai in Picardy, France, Médard founded the annual Rose Festival (Fetes des Roses). It is still held there on this day, and the region's most beautiful and virtuous maiden is crowned.